Traditionally distilled primarily as a component for blended whiskies, Scottish Grain whiskies – unlike their American or Canadian counterparts - are rarely savoured on their own, in spite of their unequivocal charm. In keeping with The Last Drop Distillers’ aim to track down rare and unique spirits from a variety of sources, we began a hunt for a rare Single Grain with which to surprise and delight our customers. This hunt bore extraordinary fruit with the discovery of a single, almost empty cask from the Dumbarton Distillery. Dumbarton distillery was built by Hiram Walker in 1938 on Castle Street, Dumbarton. It was primarily a grain distillery, however it also supported the Inverleven malt distilling plant (where the first Lomond still was developed), and at one stage was one of the largest distilleries in Scotland. Unable to renovate the site due to the tall column stills that went up through the concrete floors, the distillery was closed in 2002. 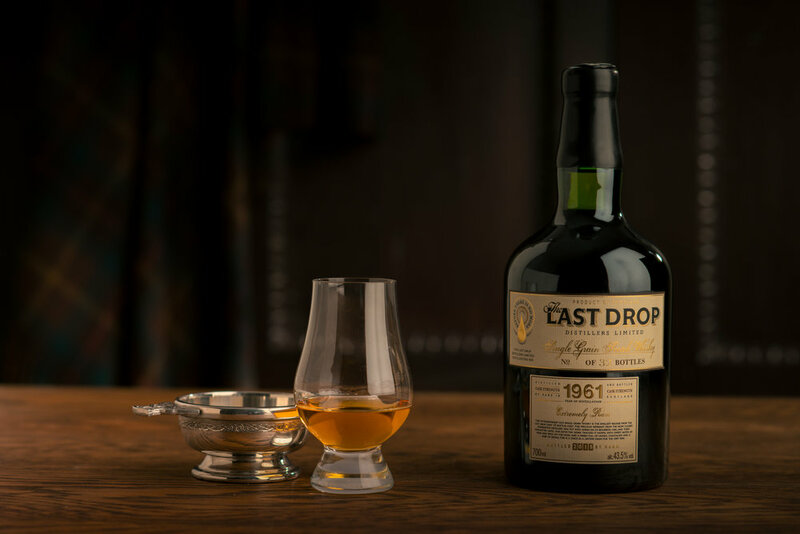 The Last Drop 1961 Single Grain is therefore an extremely special release from an historic Scottish distillery. So delicious was the Single Grain we discovered, that the Angels had taken more than ‘their share’, and left enough for only 32 bottles. This is, thus, a truly rare opportunity to taste and discover a piece of Scottish distilling history. Each of the 32 bottles has been meticulously bottled and wax-dipped by hand, and is presented in our signature chocolate-brown The Last Drop Distillers leather case. In honour of the fact that this is such a small and precious release, in additional to the generous 50ml miniature we have included a custom-made stopper together with a Last Drop Distillers tartan bag. “On the nose, a delicious waft of sweet poached pear and aromatic spices followed by fresh grain and vanilla sugar. On the palate, the whisky opens up to reveal velvety chocolate and baked apple, with subtle background notes of oak, which gives this whisky a nice complexity, balancing smoothness and age. Awarded 96 points, "A grain, glorying in its 55th year..."
“Dumbarton here displays, with a ease almost bordering arrogance, why it is the doyen of grain whiskies. It is no coincidence that the greatest ancient blended whiskies I have tasted include liberal amounts of Dumbarton. As you can see here, it has the ability to be firm enough for backbone to form, yet soft enough to ensure a yielding countenance, too.